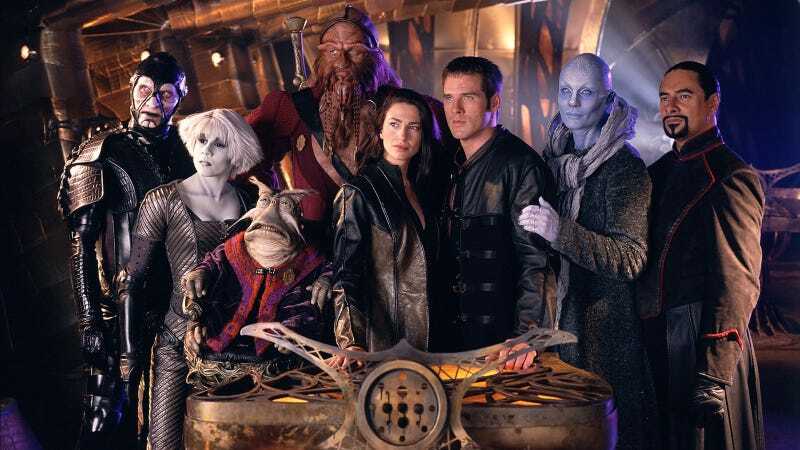 Commissioned by the Sci-Fi Channel (now Syfy), produced by the Jim Henson Company, and shot in Australia, Farscape ran for four seasons from 1999 to 2003. Now streaming on Amazon Prime, Farscape was a bizarre, gun-toting series about criminals on the run; its main cast featured two puppets, several aliens, and only one human. This, along with its daring plot lines and downright absurdity, made it an instant cult hit, but Farscape never quite reached the brand recognition of its rivals. Yet this show quietly redefined sci-fi—and we can still see its influence on the genre today. “Just make it as weird as you possibly can.” According to creator Rockne S. O’Bannon, this was the order given to him and Brian Henson, as they stood in the Syfy president’s office 20 years ago last month. The network was undergoing a major regime change, and the interim president wasn’t sure what Farscape was—“He thought it was going to be a kids’ show,” O’Bannon told io9—but his words were a showrunner’s dream. With free rein to create whatever they wanted, Farscape truly lived up to its new mandate, and as Syfy’s first original flagship show they blended wild concepts with passionate sexuality, thought experiments about war, and, of course, Henson creatures. Ok, maybe it’s not that simple. But Syfy’s new flagship show premiered to 1.4 million viewers, impressive for the network at the time, and maintained this viewership with little drop-off throughout its four seasons. Unfortunately, the Syfy Channel picked up Stargate: SG-1 in 2002, which soon eclipsed Farscape in terms of ratings. Farscape’s ratings did decline in its fourth season, if marginally, and at reportedly $2 million per episode to produce, the show became less viable for the network. The passion of Farscape’s fanbase has far from died out, even two decades after the premiere—and many Farscape fans are now behind the camera for TV and film. Actor Ben Browder (John Crichton) told io9 how often showrunners and filmmakers will cite Farscape as a source of inspiration to him. “I’ve had conversations with Bryan Fuller and…Farscape. Russell T. Davies…Farscape. When I met James Gunn, I introduced myself and he said ‘I know who you are.’ And I said ‘Yeah, I thought you did because I saw your movie, bro.’” Gunn credits Farscape as a major influence on Guardians of the Galaxy—proving that although it was short-lived, Farscape’s legacy endures. Watching the show today, it’s easy to see why Farscape is beloved, because it is still so truly original. By flinging its human protagonist to the other side of the galaxy and immersing him in alien cultures, Farscape did something no other show has achieved—it de-normalized normal, and normalized the totally bizarre. To us, John Crichton may be the perfect everyman, but to everyone around him, he is the weird, nonsensical interloper. Seemingly unfazed, Crichton insistently makes pop culture references, despite the fact that no one understands him, and dives headfirst into every weird situation. Crichton’s new crewmates are at turns baffled and frustrated with his bizarre human behavior, but they can’t help but find it endearing. And the reverse is also true, as Crichton helps a blue-hued priestess (Zhaan), a warrior (D’Argo), a haughty emperor (Rygel, a puppet), an enemy soldier (Aeryn), a thief (Chiana), a pilot (Pilot, an animatronic puppet), and a living ship (Moya), bond together to finally find what they didn’t even realize they were searching for: a family. It’s the classic stranger-in-a-strange-land story, except for once it is not the alien that is the stranger, but the human who is alien. And as Crichton is a touchstone for the audience, so the viewers, too, are thrown into a whole new landscape. This starts from the moment Crichton stumbles onto Moya’s bridge, confronted by a cacophony of guttural grunts and high-pitched trills. The aliens—D’Argo, Zhaan, and Rygel—are each communicating in their native tongues, yet they understand each other. This is thanks to the Translator Microbes that are injected at birth to all peoples in this corner of the galaxy, which was creator O’Bannon’s innovative solution to one of sci-fi’s most annoying problems. Once injected, Crichton can understand almost all verbal communication, with the exception of various technical terms, curses, and slang words. This six-foot tall creature is onscreen for a grand total of one minute. And ultimately, that’s the secret to why Farscape’s romance is so beloved by fans: It’s a genuine loving relationship. For Black, it was crucial to represent this kind of relationship. “Ben and I wanted to tell stories that would be a more healthy representation of what’s possible. Otherwise, if we stuck with the [William] Shatner model we would have perpetuated a story that I don’t think has much value, for women especially, but for men as well.” By exploring this romantic relationship over the course of many years, Farscape proved once and for all that putting the two leads together isn’t the end of the story—it’s the beginning. Criminals? Check. One human? Check. Farscape’s visual effects teams were among the best in the business, and many have found meteoric success after the show, like Damian Martin, makeup artist extraordinaire who won an Academy Award in 2016 for his work on Mad Max: Fury Road—and who honed his skills as Simcoe’s makeup artist on Farscape. But Farscape’s visual effects weren’t limited to puppetry and prosthetics. Much of the CGI was done by Animal Logic, a Sydney-based digital studio. When watching Farscape today, the CG is so good that it’s easy to forget Farscape is two decades old—so it should come as no surprise that Animal Logic has gone on to be something of a titan in the CG industry, producing effects for films like The Lego Movie, Happy Feet, Alien: Covenant, and multiple Marvel movies. This is a sentiment that has really taken off, and in the wake of Guardians of the Galaxy, space operas are painted with brighter colors, starting to really embrace the weirdness of sci-fi, as Farscape’s impact continues to ripple outward. And with the series returning to streaming, a new generation will get the chance to discover this bizarre, thrilling show, forged by dozens of talented, passionate people from different creative backgrounds. Correction: Dave Elsey and Rick Baker won an Oscar for Makeup on The Wolfman, not Best Visual Effects. io9 regrets the error. "God, I love science fiction."